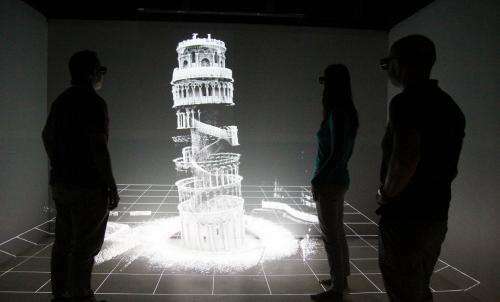 Display of final Zebedee 3D map of the Leaning Tower of Pisa. "This technology is ideal for cultural heritage mapping, which is usually very time consuming and labour intensive. It can often take a whole research team a number of days or weeks to map a site with the accuracy and detail of what we can produce in a few hours," said Dr Jonathan Roberts, Research Program Leader at CSIRO's Computational Informatics Division. "Within 20 minutes we were able to use Zebedee to complete an entire scan of the building's interior. This allowed us to create a uniquely comprehensive and accurate 3D map of the tower's structure and composition, including small details in the stairs and stonework." During 'Project Pisa', CSIRO also collaborated with local Italian scientists from Scuola Superiore Sant'Anna (SSSA) who believe the research will have significant impact on preserving the cultural heritage of the site. 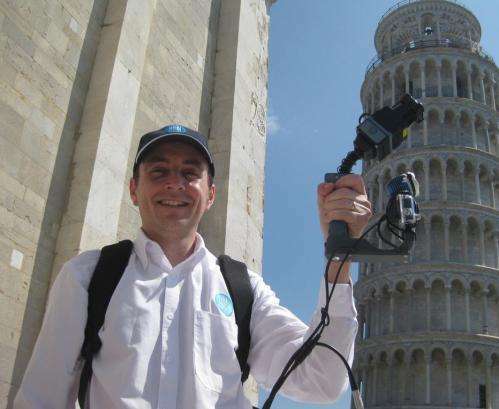 Dr Jonathan Roberts, Program Leader for CSIRO's Computational Informatics Division scanning the Leaning Tower of Pisa with new Zebedee technology. "Our detailed record of the Leaning Tower of Pisa may one day be critical in being able to reconstruct the site if it was to suffer catastrophic damage due to natural disasters such as a fire or an earthquake. Having a detailed 3D model of the world's most significant cultural heritage sites could also be used to allow people who cannot physically visit these sites to better understand and appreciate their history and architecture," said Franco Tecchia, Assistant Professor at the PERCRO - Perceptual Robotics lab. In 2012, CSIRO through its Digital Productivity and Services Flagship worked with 3D Laser Mapping, a global developer of laser scanning solutions to commercialise the Zebedee research into the ZEB1 product. As well as its applications in cultural heritage, ZEB1 is also being used to increase efficiencies and improve productivity in a number of different industries. For example, the technology is already assisting mining companies to better manage their operations and helping security forces to quickly scan crime scenes. 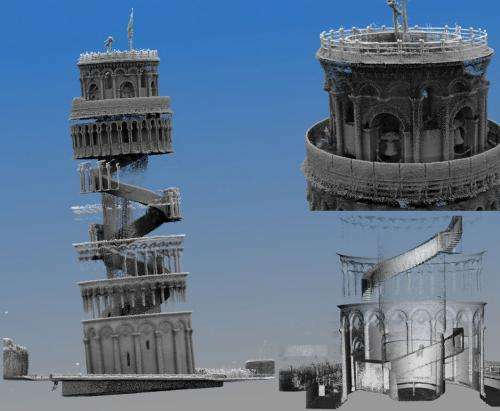 Screen shot of 3D point cloud created from CSIRO's Zebedee scan of the Leaning Tower of Pisa. CSIRO's Zebedee research was recently awarded a 2013 Eureka Prize, often referred to as an 'Australian Oscar of Science', for Innovative Use of Technology. The Australian national science agency's breakthrough 3D mapping system was also recently recognised as the winner of the Research and Development category at the iAwards, Australia's premier ICT awards program. Damn, that's a beautiful map. Game developers should be all over this tech fo creating their open world sanboxes.